I'd left Palermo with the intention of doing a "Mafia" tour of my own devising - visiting Montelepre, Monreale (the archbishop was a staunch supporter), Ficuzza and Corleone. On this sunny November day, the route to Corleone, after a detour through the primeval woods of Ficuzza, was amazingly beautiful, with views over broad valleys and ranges of mountains stacked one behind the other., the road itself lined with umbrella pines. The landscape was in contrasting greens and browns - dark brown where the soild had been freshly ploughed, and enlivened by large and small outcrops of white limestone and the occasional yellowish patch of vines. Corleone appears suddenly, round a corner, with no distant view. But access to the town was barred. A theatrically moustached carabiniere was importantly waving all traffic (ie me - I didn't see any other vehicle on the road) away from the road in, forcing me to continue uphill, with the town to my right on the SS118 towards Sciacca. I thought I might be cunning, and sneak in from the south - but access was similarly blocked. I took a photo from the only vantage point available, and retraced my journey, branching off to Piana degli Albanesi, Portella della Ginestra and S. Giuseppe Iato. It was only when I saw a paper next day that I realised what had been going on. 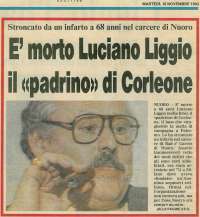 Earlier that week Luciano Liggio - Corleonese Mafia capo di tutti capi had returned home - permanently. Whether the people were mourning or celebrating was not clear. The paper had called him "il padrino" - the godfather of Corleone. 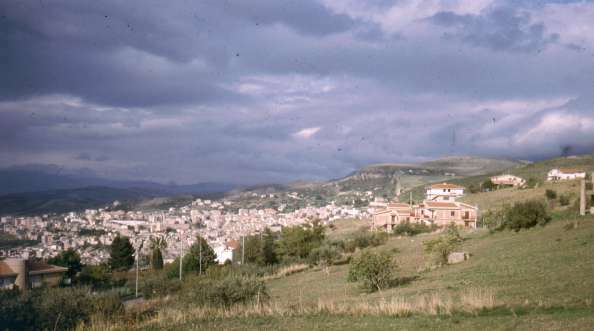 Ironically "godfather" was a title invented by Mario Puzo in his novel, which of course also - boldly - chose the name Corleone for the village from which Vito Andolino, the eponymous godfather originated. The Godfather was published in 1969; Liggio had murdered and succeeded Dr Michele Navarra as the boss of Corleone in 1958 - and was responsible for the move into heroin which vastly increased the Mafia's power and wealth in the 60s and 70s. He was finally, ten years after his first capture - and a dodgy acquittal in 1969 - been arrested (found guilty of the murder of Navarra in 1974 and sentenced to life imprisonment in Sardinia). His work was continued by fellow Corleonese Salvatore ('Shorty') Riina, who waged all out war on the other Mafia families (over 1000 mafiosi were killed in 1981-2) - and then on the state. The judges Falcone and Borsalino, who had led the belated official crackdown on the Mafia, were murdered in 1992 on Riina's orders. These murders horrified Sicily, and were still being talked about when I visited in 1993; 1993 was also the year when Riina - a fugitive since 1969 - was finally caught. Leadership is believed to have passed to his associate Bernardo ('The Tractor') Provenzano, who has not been seen since he went into hiding in 1963. Reports of his death may well be exaggerated - although he allegedly travelled to France in 2004 for an operation. There is now a Mafia museum in Corleone, which I hope to visit next time! What's new? Search the site? Main Index? Bookshop? Top of Page?